Fantastically fluffy and marvelously moist pancakes. That’s what you get when you add a luxuriously creamy element like mascarpone to your pancake batter. And lemon? Well, lemons are tangy and delicious. This makes for an elegant, perhaps even slightly elevated, variation to the usual Sunday morning pancakes. Also, it’s a great excuse to add mascarpone to your shopping list (unless you already buy it regularly. In which case your shopping list is, well, different to mine.)! And if that weren’t enough, we’re going to top it off with a divine berry compote. Start this recipe like any other pancake recipe – by sifting all the dry ingredients together (flour, 2tbsp sugar, baking powder, and salt). Add the lemon zest and mix well. In a separate bowl, add milk, mascarpone, oil, and vanilla extract. Whisk together to combine. Add mixture to the dry ingredients mixture, and whisk till mostly combined. Common Sense: Take your mascarpone out of the fridge and let it come to room temperature to allow for easier whisking. I say this because common sense isn’t very common. Okay… fine! I admit it. I keep forgetting this part! Whisk your egg white separately to form stiff peaks. Add this to the batter, and fold gently to incorporate. The whipped up egg white just adds a heavenly lightness to the pancakes – somewhat similar to what you’re aiming for when making a very light mousse or a soufflé. Optional: Allow the batter to sit at room temperature for 20-30 minutes – a little time to let the ingredients in your batter really incorporate, resulting in even fluffier pancakes. I use this time to start washing up, and to prepare the berry compote. – One of the best things my mother ever taught me. I’m pairing the pancakes with a mixed berry compote. You can easily swap this out for honey or maple syrup but I LOVE berries. And this compote is something special – ridiculously simple, but delicious enough to make you scoff at any restaurant-made compotes! Try it, you won’t be disappointed. In fact, I’m pretty sure you’ll end up using this compote recipe for all your berry compote needs! In a small pot, combine 3tbsp water, 1tbsp sugar, and mixed berries. Bring the mixture to a slow simmer, occasionally stirring to help breakdown the berries and reduce the mixture. Add the balsamic vinegar. Stir, and let the compote cook for a few minutes more. Balsamic vinegar just elevates the compote to a whole other level. Give the compote a gentle mash with a fork if your berries still look too solid. The thickness of the compote is to your preference – some like it runny, some like jam in a pan. I prefer a viscous, slightly viscid (bet you didn’t expect to read that word today! ), syrupy consistency. Heat a non-stick pan (ideally, a heavy-bottomed one for a more even distribution of heat) over a medium heat and coat it with oil. Using a ¼ cup measure to drop dollops of the batter into the pan to create nice even pancakes. Cook until the bottom is golden brown and there are a few bubbles forming through the top. Flip and repeat. Adjust the heat as necessary. Serve with the compote. Heads up! The following is an affiliate link. If you buy something through it, I will receive a small commission. You won’t need to pay a penny more, but it’ll help keep my lights on! Thank you, bestie. You’re the best! This Silver Dollar Pancake Pan is handy if you’re the type that likes your pancakes to be perfectly uniform! If that’s not your type of thing, make sure to check out the Shop for more ideas! Is this Lemon Mascarpone Pancakes recipe more work than other pancake recipes that don’t involve the same work? A little. Does it take more time? Maybe a tad more. But if you’re looking for an elegant twist to your standard pancakes, it’s worth it. The result is a delicious and versatile pancake recipe that works as both a feel good brunch, and as something to impress your weekly brunch bunch with. Feel free to mix it up! Some days I’ll stir fresh blueberries straight into my batter (before folding in the egg white) because life is too short not to put blueberries in your pancakes. A recipe for fantastically fluffy and marvelously moist lemon mascarpone pancakes. An elegant twist to the classic pancake breakfast. Sifting all the dry ingredients together (flour, 2tbsp sugar, baking powder, and salt). Add the lemon zest and mix well. Whisk your egg white separately to form stiff peaks. Add this to the batter, and fold gently to incorporate. Optional: Allow the batter to sit at room temperature for 20-30 minutes. 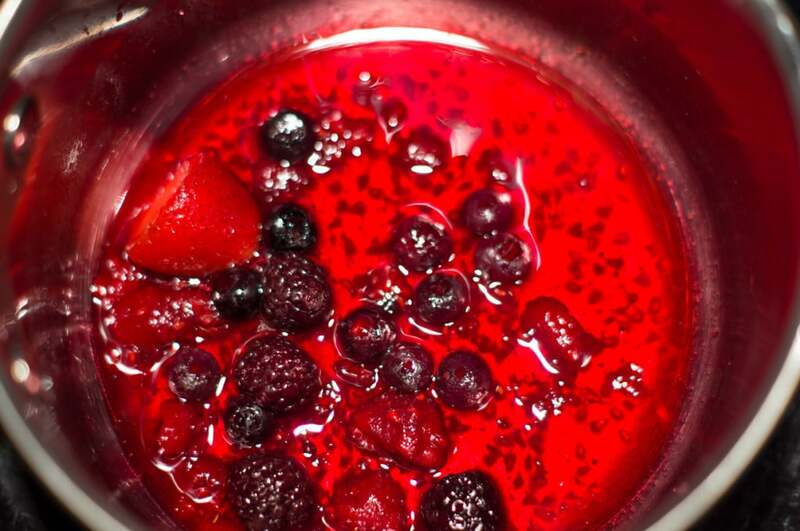 Prepare Compote: In a small pot, combine 3tbsp water, 1tbsp sugar, and mixed berries. Bring the mixture to a slow simmer, occasionally stirring to help breakdown the berries and reduce the mixture. Add 1tbsp balsamic vinegar. Stir, and let the compote cook till desired consistency is achieved. Cook until the bottom is golden brown and there are a few bubbles forming through the top. Flip and repeat. Adjust the heat as necessary. Serve with the compote. Thank you so much for submitting to YG! We hope you continue to submit. We have pinned, google+’ed, shared, tweeted, and yummed! Glorious image of a stunning recipe! I usually make wholemeal drop scones with some heated up frozen berries , well I say usually but it’s been a while since I’ve made them. 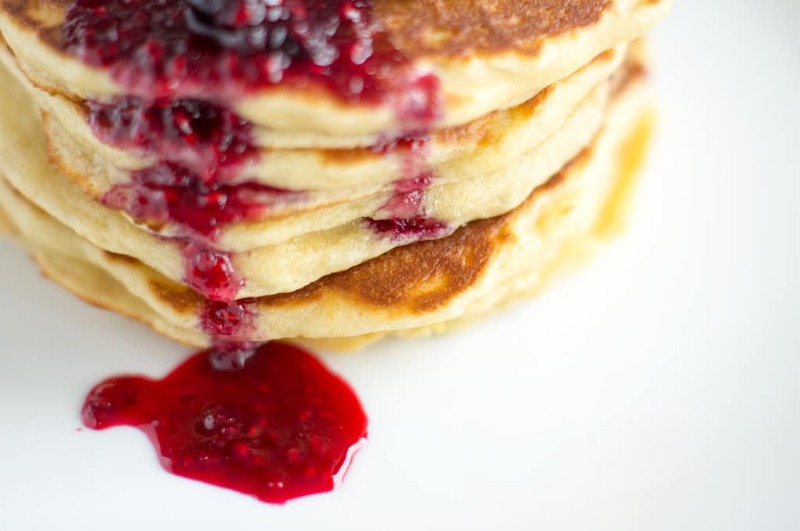 You’ve got me hankering after pancakes again and I love the idea of putting balsamic vinegar in the compote. Shopping list updated to include mascarpone! Mmmm I love scones! I’ve been working on a few recipes to post here in the not-so-distant future too. Just a touch of balsamic to compote does wonders! Thanks Stephanie! Glad to hear you and your mister enjoyed them! Those look so good. 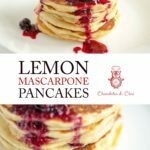 I really like the idea of lemon and mascarpone – what a sinful pancake!! Thanks! I personally love this recipe, lemon and mascarpone work so well together! I found your recipe today when I was craving pancakes and saw some leftover Mascarpone in my fridge…want to try them for tomorrows breakfast. Just wondering where the egg yolk is going?!? Use the leftover egg yolk to make an extra yolk-y omelette on the side! Or some sort of custard! …This recipe only needs the egg white. Hope you enjoy it Chrissy! My wife and I made this recipe this morning. It was very nice! We are newlyweds and not the most adventurous cooks! Thank you. Congratulations on your recent nuptials! 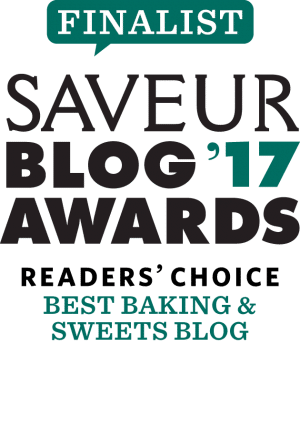 I’m very happy to hear that you enjoyed the recipe – it takes a few little baby steps, but I’m sure you’ll be kitchen adventurers before you know it! Thanks Agnese! I hope you enjoy it! 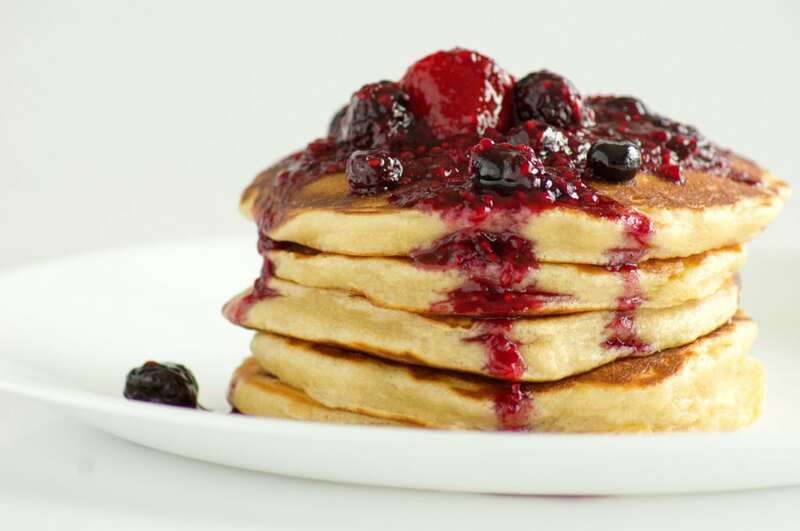 These pancakes look divine – it’s always pancake time as far as I am concerned!! 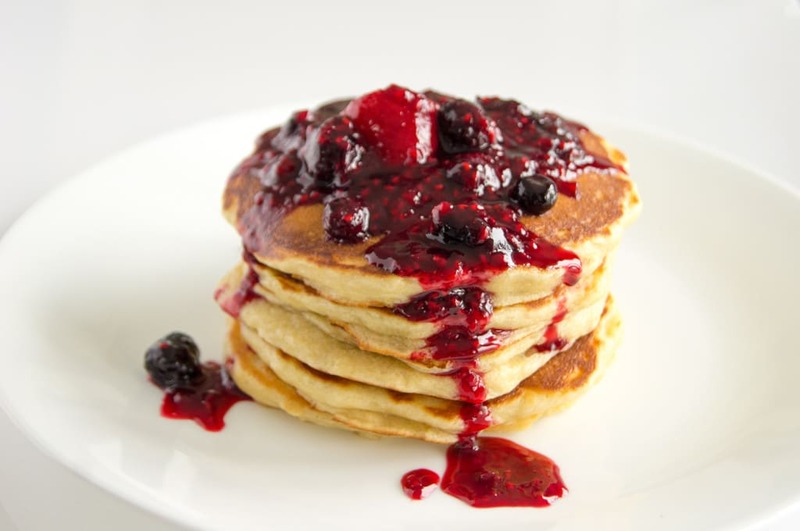 These pancakes look heavenly nad so very delicious.The mascarpone must have made them so rich and delicious. Thanks Nayna! The mascarpone does indeed make them rich and delicious!! Oh my, this sounds heavenly! I will have to try it!! Thank you for this recipe! I made these pancakes this morning and they were outstanding! Decadent but light, and perfectly lemon scented. Very impressive! I really loved the compote with the drizzle of balsamic vinegar. My only comment is with the compote I missed the light lemon flavor of the pancakes. Definatly enjoy some bites with and without the compote. I also did not reduce my compote enough, and it made my pancakes soggy. My fault entirely! This recipe is my new favorite for brunch with family and friends. I cannot wait to share this with them! Thanks so much for your comment! I agree, definitely have a few bites without the compote and see what you prefer! Glad you loved the pancakes!! Can I make the batter the night before? I’m making them for 24 people. Hi there Dorothy! 24 people?? Wow! I’ve never made the batter in advance, but yes – I can’t think of any problems with making the batter the night before. Make sure to keep it refrigerated though! Good luck!!! These really hit the spot this morning, totally what I needed. Hey! That’s awesome! I’m so glad to hear you enjoyed them! I am happy to find! This pancakes very tasty! Thank you so much! I’m very happy to hear you enjoyed them! i made these this weekend. It was really really good! Hi Tracey, that’s lovely to hear! I hope you make them again! Hi Riz, this is an absolute fabulous combination. I made and published it this weekend! Thanks for inspiring me! Hey Toon! That’s awesome, I’m so glad to hear you enjoyed it!